Peace River Organic Honey is proud to offer the only honey certified as both organic and non-GMO. 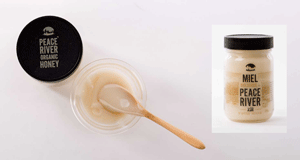 Our entire process, from hive to honey jar, is free from chemicals, pesticides and antibiotics. As a True Source certified apiary, we can trace every delectable drop of our honey to the pristine Peace River region we call home. The area?s cool climate and abundant fields of red clover and wild alfalfa create a honey that?s delicately sweet and distinctively light in colour.